C/o. Kancharapalem is a beautiful depiction of life in a village and is categorized in the romance genre. It is a reflection of life in its purest form and is guaranteed to resonate with all viewers as the story is portrayed by the residents of Kancharapalem (is a locality in the city of Visakhapatnam) themselves. Almost the entire cast of the film, i.e. around 80 people, have been selected from real life and from Kancharapalem locality. As the film has been made with a conviction that they shouldn’t miss the nativity and to be more raw and realistic. Not to miss the essence. This film, produced by Dr. Vijaya Praveena Paruchuri (a New York based Cardiologist) and directed by Venkatesh Maha, has already set a remarkable achievement of being the first ever Telugu film to be selected for the New York Indian Film Festival 2018 - a clear hallmark of its content’s authenticity and honesty. Dr. Vijaya Praveena Paruchuri also acted in the film and equates the essence of C/o. Kancharapalem to ‘Malgudi Days’ in the way the town stands witness to four stories unfolding within its neighbourhoods. Suresh Productions, one of India’s largest production/distribution companies contributing to both regional and national cinemas since 1964; recognized the genuine storytelling of C/o Kancharapalem and are presenting the film. 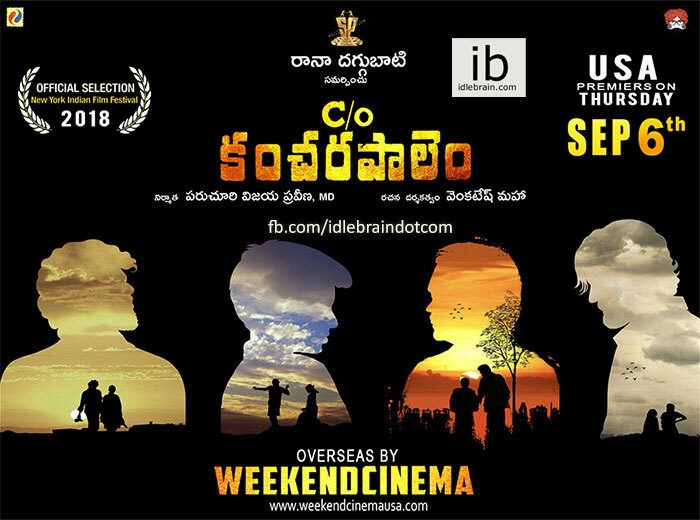 Weekend Cinema - a film distribution company (USA) with the prime intention of showcasing good content cinema is proud to be associated with Suresh Productions and distributing C/o Kancharapalem to overseas (USA, Canada, Australia & New Zealand) movie enthusiasts and viewers.